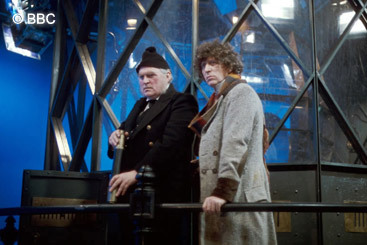 The actor providing the voice of K-9, John Leeson, delighted Tom Baker and the rest of the cast and crew by scuttling around in character on all fours during rehearsals. 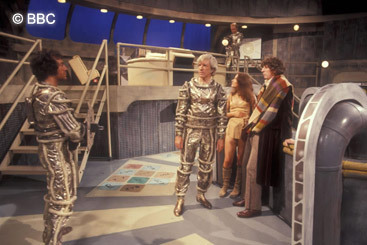 This enabled the Director and the actors to work out their shots and eyelines before they encountered the radio-controlled real dog in the studio. Some of my best friends are humans, but when they get together in large numbers, other life forms sometimes suffer. In the year 5000AD a spacecraft carrying a relief crew to a mining station on one of Saturn’s moons passes through a dust cloud containing an intelligent space virus. The virus is seeking a habitat in which to breed and multiply, and infects the crew of the shuttle, bringing them under its influence. Landing at Titan moonbase the infected astronauts kill the station’s crew and manage to infect the supervisor (Michael Sheard) – but not before a distress beacon is activated. 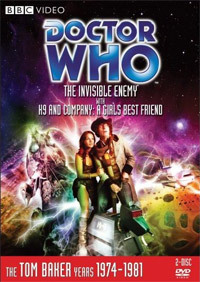 The Doctor and Leela answer this signal but on their way to help, the TARDIS also passes through the virus cloud, and an infection containing the nucleus of the swarm invades the Doctor’s brain. 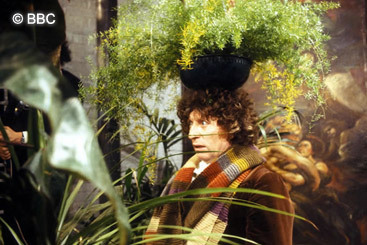 The Doctor’s mental strength enables him to avoid succumbing to the virus’s will, but he knows he can’t hold out for long without help. Under guidance Leela takes him and the supervisor for treatment at a medical space station in Saturn’s asteroid belt. 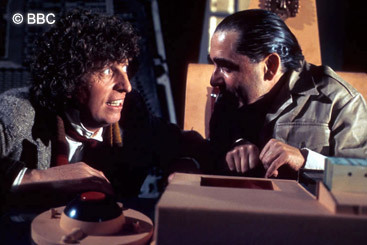 There the Doctor is put under the care of Professor Marius (Frederick Jaegar), who possesses a dog-shaped, mobile computer named K-9. Using equipment in Marius’s lab, short-lived clones of the Doctor and Leela are created, miniaturised and injected into the real Doctor’s spinal cord – their mission: to track down and neutralise the nucleus before its breeding cycle begins. However, the Titan base supervisor infects others in the medical centre and they mount an attack on the lab, intent upon preserving their swarm leader. The nucleus manages to evade the injected clones, escapes from the Doctor’s body and, with help from infected technicians, reverses the miniaturisation process to grow large enough to become part of the macro-world. Rescued by its infected drones, the crustacean-like monster is flown back to Titan, where it begins using the base’s storage tanks to hatch and nurture its eggs. 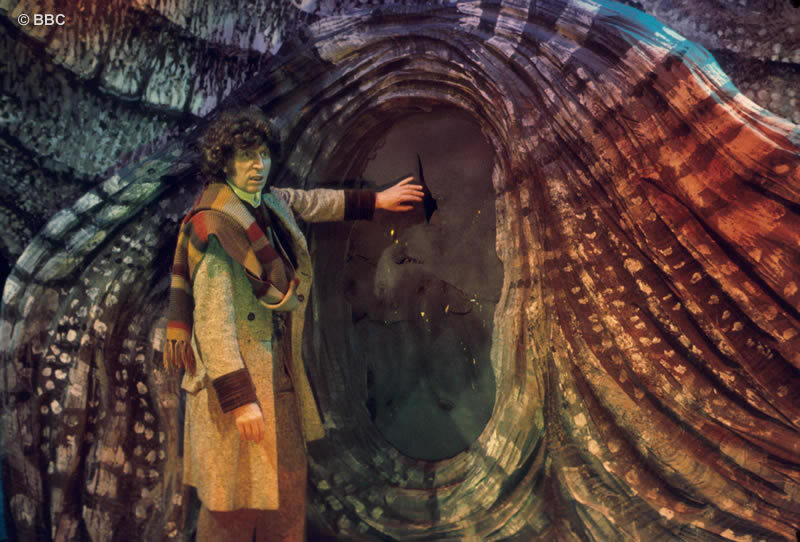 Freed from infection, the Doctor pursues the creature to Titan, and destroys the emerging swarm by releasing methane and oxygen into the moon’s atmosphere, then detonating it to form an all-consuming fireball. Back at the medical centre Marius asks a favour of the Doctor and Leela. He has been summoned back to Earth, but won’t be allowed to take K-9 due to weight restrictions. Would they be willing to look after his robotic friend? K-9 makes the decision for them by entering the TARDIS.